From protecting customer experience to preserving lines of revenue, IT operations teams face increasingly complex responsibilities and are responsible for preventing outages that could harm the organization. As a Splunk customer, your machine data platform empowers you to utilize machine learning to reduce MTTR. 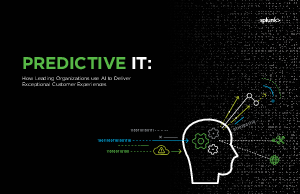 Discover how six companies utilize machine learning and AI to predict outages, protect business revenue and deliver exceptional customer experiences.